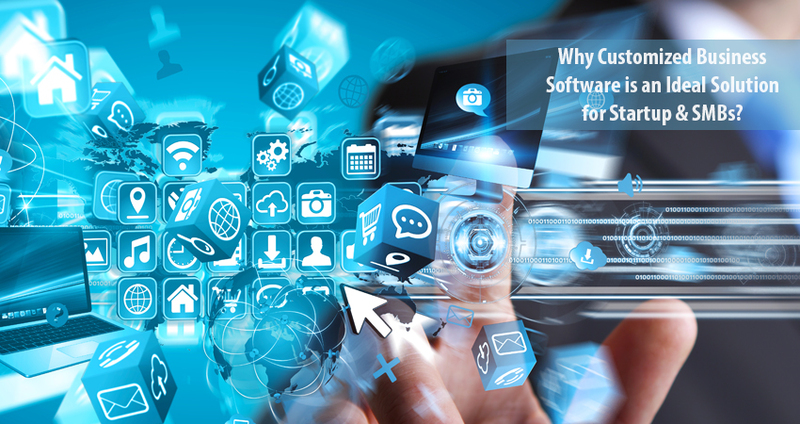 Why Customized Business Software is an Ideal Solution for Startup & SMBs? Traditional office suites are currently used by different businesses might be quite useful for many companies. These type of solutions are mostly adopted by developed and large enterprises. Because they can hire an in-house team of IT experts to configure and manage the software. They can also help its integration for multiple users. But if you’ve started a new business, traditional software is not a right solution for you. You don’t need to purchase a complete business suite because most of its parts and features are not for you. Therefore, a cloud business software is an ideal solution for business. No need to purchase the features that you don’t need. The customized cloud software is undoubtedly a great choice for your business. A customized cloud software is a complete solution that provides everything according to your business demand in lower budget. It includes wide-range of features that the software is going to offer SMBs i.e. data sharing, data storage and building blocks etc. It keeps you connected and make the access to data easier. So, no more need to tie to your desktop because it is offering the flexibility of usage & access. How Customized Business Software Work for SMBs? So, now there are a lot of questions, i.e. how these cloud applications are perfect, what is the procedure of working etc.? Here we have compiled few significant points to make it easier to understand. In a traditional office suite, you need to purchase a complete solution. But cloud business software gives you an opportunity to choose different required software and mix them all. Let’s suppose you might need an accounting, payroll software along with CRM. No need to worry about it, just share the requirements with your service provider and they’ll mix them all to provide you with a single solution. In the market, there are a lot of software development companies offering wide-range of solutions. A solution that might use by the competitor is not perfect for you. Therefore, find out the one that meets all your requirements and perform the job according to your business needs. You have to search different vendors and share all your concerns along with the feature list. If your required solution is not currently available in the market, as the vendor and they’ll prepare it for you. So, you can easily get what your business need and no more need to sacrifice the significant features. No more need to wait longer to upgrade the software. The cloud platform is offering fact software upgrades as well as bug fixing. They’ve developed a variety of small software and compiled them according to your business requirements. So, it is quite easier to update code and fix the things. Furthermore, you don’t have to spend time waiting during system upgrades. All will be done from backend and it will not interrupt your performance. Cloud is offering you to combine all of your required products to keep them connected. You don’t have to purchase different software that might execute to different hardware. This is the best approach to connect all your featured business software applications to a single solution. You can simply build a software the perfect suites all your business functionalities. If you’re running a business with the right strategy, its growth should be a major concern. In a growing business, you may need more staff, data storage space, and software. This is not a big problem with cloud based solutions. The best cloud accounting software allows you to scale up and down with business. You can include the unlimited users by discussing with your vendor. The growing period is not going to increase the expense. Today’s market is changing rapidly along with updated technological solutions. There are thousands of developers working to manage the business software according to upcoming technology requirements. They’re trying to provide you the best business tools that make your job easier. Cloud technology is currently the strong requirement of the rapidly changing market. Today most of the business suites are actually cloud based products. That allows the user a simple and instant access through available devices like desktop, laptop, smartphone, and tablets etc. You can carry and manage all of your important tasks anywhere, anytime from any device. The limitation to tie to your seat is no more. You can even manage work while enjoying vacations on the beach with two things an internet connection and a smart device. So, this is a right time to get benefit from technology and find the perfectly customized business software for your business. You just need to put the effort into planning to purchase the right tool for your business software. Therefore, stay connected and update your solution to run the business in streamline way.